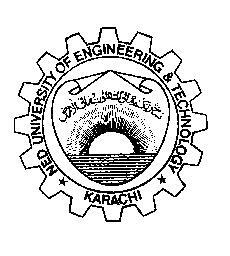 One of the major institutions of higher learning in Pakistan, the NED University of Engineering and Technology is located in Karachi, the country's biggest city and main port. And before you ask us, NED stands for Nadirshaw Eduljee Dinshaw; a Parsi philanthropist whose benevolence made the then NED College of Engineering and Techology possible. However, now that NED College has become the NED University, no one uses the full form of the name and very few even remember what it was supposed to stand for. Strictly speaking, the NED University encompasses the main main campus near the Karachi University in Gulshan-e-Iqbal as well as the Dawood College of Engineering & Technology and the Pak Air Force's Engineering College in Risalpur. However, most of the attention here is focused on the main campus. I am hoping some Dawoodians will hook up with us and make this more inclusive. On the main campus, we have the departments of Civil Engineering, Mechanical Engineering and one called Electrical and Computer Systems Engineering. Metallurgical, Electronics and Chemical Engineering are offered at Dawood College. (I think there is one more, but I am writing from memory. Will some Dawoodian please correct me or confirm?) The Architecture program is at Dawood, too, but behaves for the most part as an independent entity from the rest of the College. Risalpur is where Pakistan's only curriculum in Aeronautical Engineering is offered. A database of NED students and alumni. ECN is an unmoderated mailing list dedicated to the students, alumni, and teachers of NED University of Engineering & Technology, Karachi, Pakistan. Folks that call themselves "NED USA Alumni"
I know there are organizations of NEDians around the world - the biggest in Karachi itself - but I am not in contact with any and certainly don't know of any on the Web or the Internet. However, I have not lost hope so if you can help me out in this direction, please do. Again, there's a bunch of folks that call themselves "NED USA Alumni"
FASTICS, or FAST Institute of Computer Science. This institution is run by the Foundation for the Advancement of Science and Technology, FAST. Thus the name. Shaheed Zulfikar Ali Bhutto Institute of Science and Technology (SZABIST). A list of Pakistani Institutions, Syed A. Maroof, coordinator of the Pakistani Student's Association International's Technical Assistance Committee, is trying to put together. © Last edited March 12, 1996, SIA. © Created November 10, 1995, at http://www.rpi.edu/~ashrafs/ned.html. SIA.